-Goldbeard only appears on reels 1 & 5 in normal games. -Goldbeard substitutes for all symbols except scatters. -The prize is doubled when one or more Goldbeards appear in a winning combination. -All symbols pay Left to Right except scattered Coins, which pay any. 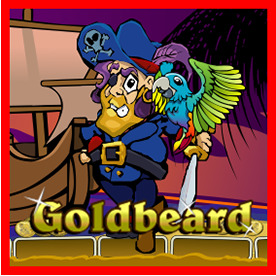 -When one or more Goldbeards appear on both reels 1 & 5, each will reveal 2,3 or 4 free games. -Goldbeards can appear on reel 3 during free games. -If Goldbeards occur on both reels 1 & 5 during the feature, additional free games will be revealed. -All wins are tripled during free games. -Free games are played at the lines and bet of the feature triggering game.